Identifying and mapping production zones in diverse landscapes based on native pastures enables development and implementation of appropriate management strategies to make efficient use of inputs and manage environmental issues. At Panuara, the Orange EverGraze Proof Site, it was demonstrated that the landscape could be mapped based on indicators of production capacity so that precision management decisions such as fencing location and fertiliser application could be made, resulting in efficient use of inputs and management of environmental risks. Late spring was a good time to determine the different production zones as differences in soil moisture content and corresponding senescence/drying off of pastures were obvious. It is also easy to distinguish different pasture species at this time. Soil water holding capacity was strongly influenced by production zone. The High Production Zone (HPZ) was able to store an extra 30% more soil water in the root zone than the Low Production Zone (LPZ), and this meant that it took longer to deplete, giving a longer period of pasture growth and consequently higher production. The greater water holding capacity in the HPZ was due to deeper top soil and less gravel. Pasture composition was strongly influenced by position in the landscape. Higher quality species such as Microlaena (Microlaena stipoides) and sub clover (Trifolium subterranean) were more prevalent on the lower slopes or HPZ, while the upper slopes or LPZ were dominated by wallaby grass (Rytidosperma spp., formally called Austrodanthonia spp.) and had a much lower production potential (Figure 1). Traditional application of superphosphate evenly spread across the whole paddock meant that before the experiment began, all production zones were treated equally. A soil survey showed the legacy of this approach, particularly phosphorus levels increased from the HPZ to the LPZ, indicating previously applied fertiliser had not been utilised in the LPZ due to lower water holding capacity and subsequent low pasture production. Pasture production was strongly influenced by production zone. Annual pasture production was 9.9, 6.1 and 4.6 tonnes dry matter per hectare (DM/ha) for the HPZ, Medium Production Zones (MPZ) and LPZ respectively. On a site with gentler slopes in Chiltern in northeast Victoria, species were mapped against soil characteristics. Microlaena occurred more commonly on soils that were non-sodic and low in phosphorus. The drier parts of the site were dominated by speargrass (Austrostipa scabra) and wallaby grass, which were also characterised by higher phosphorus and organic carbon levels. Wallaby grass also occurred in parts of the site with higher exchangeable aluminium (Al). The relationship between the landscape, the soil properties and where wallaby grass and Microlaena were found were consistent with the results from Panuara. 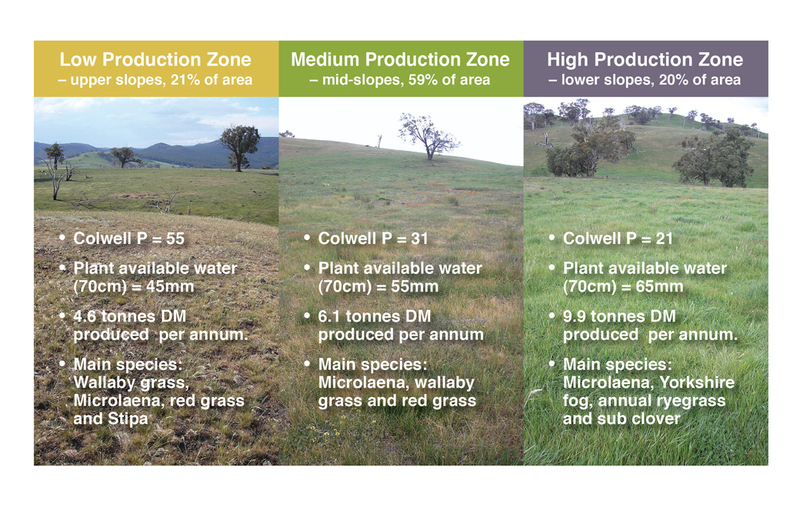 Figure 1: Production zones at Panuara, showing the differences in soil phosphorus (Colwell P converted from measured Bray P, Plant Available Water (PAW) and differences in native perennial grass species). The landscapes of the high rainfall zone (HRZ) of south eastern Australia, where native perennial grasses dominate pastures, are generally highly variable across aspect, slope, and soil depth, texture, fertility and plant available water (PAW). This variability influences pasture composition, production, feed quality and affects grazing behaviour. Traditional management recommendations have ignored landscape variability; therefore fertiliser levels and grazing systems have largely been inappropriate. In addition, variable landscape and the corresponding native pastures are often fenced into large paddocks, which make improving grazing management more difficult. At the Orange Proof Site, a variable native pasture landscape was divided into three production zones. The site aimed to understand how species composition; soil fertility and condition; and production were influenced by landscape, and how the variability between production zones could be managed with different grazing systems. It was thought that greater subdivision of a variable landscape would help improve utilisation by livestock and reduce degradation. This page presents information on landscape variability found at the Panuara site. For results and messages from the grazing treatments, see the Orange Proof Site page. Like most native pastures in the Central Tablelands, the Panuara site is undulating and highly variable in aspect, slope, and soil type and depth. The altitude ranges from 770 to 820 m above sea level. There are large differences in the capacity for pasture production due to topography. In the spring prior to the beginning of the experiment, the site was classified and mapped into three production zones (Figure 1) and three grazing treatments (1-Paddock, 4-Paddock and 20-Paddock) were imposed (see the Orange Proof Site page for details and results of the grazing treatments). To understand the differences between the production zones, and to develop corresponding management strategies, the landscape was mapped according to soil characteristics, pasture composition and topography. Soil water and pasture growth were then monitored over time. Details of the site description and monitoring are described below. In September 2007, before the grazing systems were put in place, soil samples and pasture composition were monitored on a 33 x 33 m grid across the site. At each point, ten 0-10 cm soil cores were taken within a 4 m2 area and were analysed for soil colour (Munsell), phosphorus (Bray) and pHca. Pasture composition and herbage mass were assessed using BOTANAL techniques (Tothill et al., 1992). Low Production Zone (LPZ) – pastures had dried off with no living annual species. The three production zones are represented in Figure 1 (above). Soil water was monitored with five to six access tubes in each plot (50 in total), stratified across the HPZ, MPZ and LPZ. A neutron probe was used to measure volumetric soil water content at 20 cm intervals from 10 to 190 cm in depth (where possible), every four to six weeks. Plant available water (PAW) was calculated by subtracting the driest reading from the measured volumetric soil moisture measurement and then multiplying by the depth increment (20 cm) and then summed for the top 70 cm. Net pasture growth was determined using exclusion cages at four to six week intervals from 2009. Pasture growth was monitored in the vicinity of the neutron probe access tubes (<5 m) so that it could be related to the soil moisture availability. Pasture growth was summed for each tube for each production year (From March to February) and determined for each production zone. To understand the grazing behaviour of sheep across the different production zones, ewes with lambs were monitored using GPS collars fitted to four randomly selected ewes in the 1-Paddock system. Measurements were taken in two periods – the end of spring while ewes were lactating (November 18 – December 8, 2010); and the start of autumn when ewes were dry (March 2 – March 22, 2011). Positions were recorded every 15 seconds and included the date, time, latitude, longitude, temperature and satellite number. Motion sensors within the collars were used to estimate when grazing was occurring. During each study period a single paddock within the MPZ of the 20-Paddock system was also monitored and the composition and quality of the diet selected by grazing ewes estimated. Simultaneously the composition and quality of the diet selected by ewes managed within the 1-Paddock system was also monitored. At Panuara, the HPZ represents 20% of the site and was mainly found at lower elevations or in drainage lines where there was greater soil depth (Figure 2). The MPZ represents 59% of the site and was mainly found in the mid-slope area. The LPZ represented 21% of the site and was found at the top of the ridges where there often was coarse and gravelly soil. Figure 2: High (green), medium (orange) and low (purple) production zones and elevation contours at Panuara. Production zone significantly influenced species composition due to variation in soil texture, fertility and water holding capacity, livestock grazing patterns and microclimate. Prior to the experiment beginning in September 2007, eight of the ten most common species showed a relationship with production zone (Figure 3). Wallaby grass increased in herbage mass from the HPZ to the LPZ, which was the opposite of total herbage mass. Microlaena had the greatest herbage mass in the HPZ and MPZ. Sub clover and onion weed both increased significantly from the LPZ to the HPZ. Annual ryegrass (Lolium rigidum) had the highest herbage mass in the HPZ, but made up around 30% of the total pasture composition on each production zone at this time. It is worth noting that annual ryegrass consistently made up a higher proportion of the HPZ pasture composition (compared to the MPZ and LPZ) from autumn 2008 and for the duration of the experiment. Yorkshire fog (Holcus lanatus) was greatest in the HPZ, while common wheatgrass (Elymus scaber) and Bulbosa poa (Poa bulbosa) were greatest in the MPZ. Figure 3: Average herbage mass (September 2007) of the major species (>25kg DM/ha) in the HPZ, MPZ and LPZ. Values followed by different letters are significantly different (P<0.05). At Panuara there were significant differences from the HPZ to the LPZ for soil phosphorus, pHca, and herbage mass (Table 1). The highest phosphorus levels were in the LPZ and lowest in the HPZ. Soil pHca was highest in the HPZ and lowest in the MPZ and LPZ. Herbage mass increased from the LPZ to the HPZ. The LPZ had shallower and more coarsely textured soils with lower water holding capacity and pH that most likely limited pasture production and clover persistence resulting in incomplete utilisation of applied phosphorus fertiliser. Movement by sheep to the LPZ (see Broadford Grazing Experiment) and immobilisation (Williams and Simpson) due to anaerobic conditions caused by seasonal water logging in the HPZ are two other possible causes of the phosphorus gradient, although sheep camps were excluded for analysis and the latter is more likely. The inverse relationship between phosphorus and sub clover was unexpected, as low phosphorus levels often limit clover production. The gradient in soil phosphorus, identified from the HPZ increasing to the LPZ suggest superphosphate fertiliser application should be targeted at the HPZ. As this is only 20% of the site it decreases the cost of fertiliser application. At Panaura superphosphate was applied to the HPZ of all treatments at 250 kg/ha and 125 kg/ha in April 2009 and 2010 respectively. 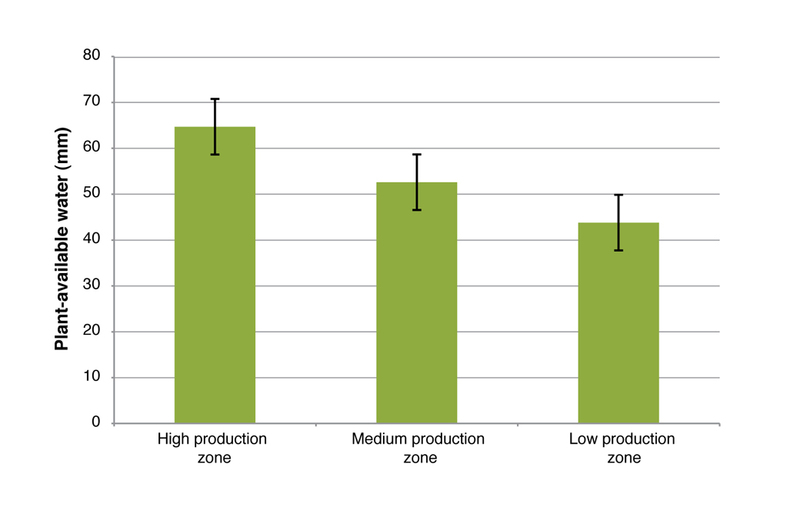 The amount of water held in the soil was significantly influenced by the production zone, with plant available water greatest in the HPZ and lowest in the LPZ (Figure 4). After periods of soil moisture accumulation, usually from late winter to early spring (eg. October 2008, and 2010; Figure 5), there was greater plant available water in the HPZ. This was also witnessed when high volumes of rainfall occurred (eg. February and March 2010). It appeared that differences were due to the ability of the soil in the HPZ to store additional soil water, which took longer to deplete, giving a greater period of pasture growth. 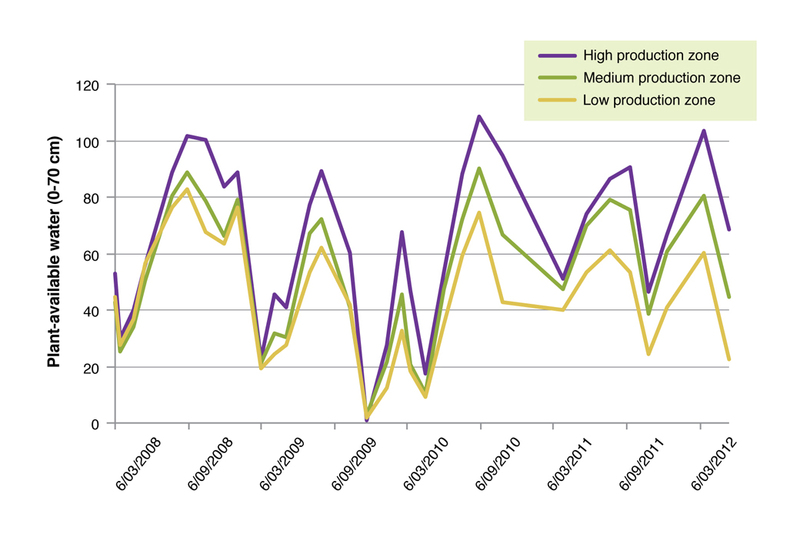 All production zones were depleted to similar plant available water in dry periods (eg. March and November 2009). Figure 4: Average plant available water to 70 cm for the HPZ, MPZ and LPZ. The error bars indicate the level above which differences between treatments are statistically significant. Pasture production was strongly influenced by production zone, presumably due to the differences in plant available water. The average annual pasture production from 2009 to 2011 was 9.9, 6.1 and 4.6 t DM/ha for the HPZ, MPZ and LPZ respectively. The HPZ was significantly higher than the MPZ and LPZ. In the grazing observation study, sheep consistently selected the green vegetative plant material from within the native pasture, and the species selected varied seasonally. At the two different times (late spring and early autumn) in the 1-Paddock treatment (where sheep had access to all production zones), ewes preferentially utilised the HPZ at the peak grazing periods in the morning (0500 to ≤ 0900 h) and when lactating (late spring period) during the evening (0500 to ≤ 0900 h). They generally avoided the LPZ at these times. Grazing activity was lower in the middle of the day and ceased at night, where ewes rested in the MPZ (late spring period) or LPZ (early autumn period). The forage quality (nitrogen % and metabolisable energy) of the green pasture in the HPZ was generally higher than the LPZ in the 1-Paddock treatment, and the MPZ measured for the 20-Paddock treatment. This is likely due to the higher quality pasture species, higher utilisation rate and higher soil moisture traits of the HPZ which result in pastures remaining vegetative for longer. The greater production per head of animals grazing within the 1-Paddock system (discussed in Grazing systems influence production) was likely a consequence of the animals maintaining areas (patches) of high quality pasture and consuming greater quantities of dry matter and energy. The lower utilisation of the LPZ was unexpected, given that sheep camping behaviour on farm often results in areas at the bottom of hills being underutilised and left to go rank, with areas towards the top of hills being vulnerable to bare ground resulting from overgrazing. These results indicate that in addition to sheep camping behaviour, differences in pasture quality characteristics also have a role to play in grazing patterns. The Chiltern EverGraze Proof Site in northeast Victoria was located on slopes with relatively gentle gradient, low soil fertility and also had a native pasture base. As with the Panuara site, pasture species composition was also mapped and analysed against the soil characteristics. Microlaena was the dominant native perennial grass across the Chiltern site, with sweet vernal grass (Anthoxanthum odoratum) being the dominant annual species. The relationship between the landscape, the soil properties and where wallaby grass and Microlaena were found are consistent with the results from Panuara. Microlaena occurred more commonly on soils that were non-sodic and low in phosphorus. The drier parts of the site were dominated by speargrass (Austrostipa scabra) and wallaby grass, which were also characterised by higher phosphorus and organic carbon levels at 0-10 cm. Wallaby grass also occurred in parts of the landscape that had higher exchangeable aluminium (Al). The results from the Panuara site demonstrate how production zone can be used as a means of classifying the landscape. 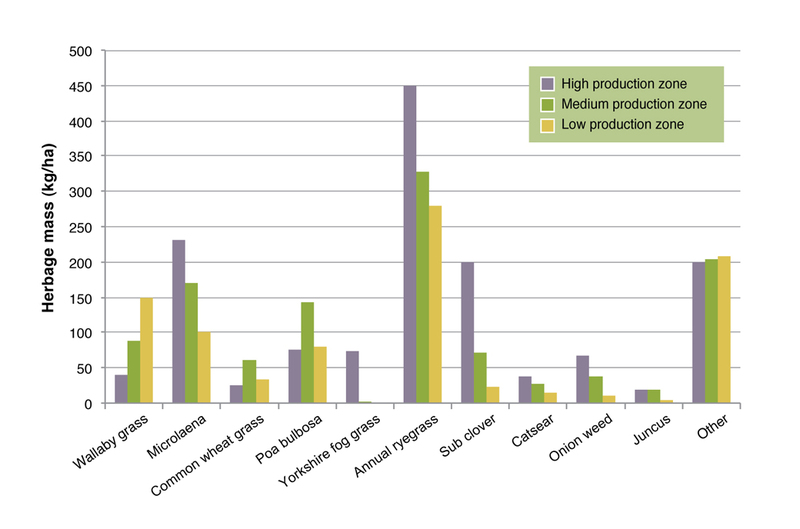 Key identified differences between production zones which have potential to impact production and management included the soil fertility (phosphorus), soil moisture, and corresponding species composition and pasture growth. Differences in soil fertility and composition between production zones have important implications on the efficient use of fertiliser. The pasture composition and seasonal productivity differences will also result in differences in carrying capacity, suitability of the pastures for different livestock classes (eg. growing stock) and seasonal management requirements. Therefore there may be advantages in fencing and managing each production zone separately to maximise utilisation of the HPZ, while preventing degradation of the LPZ. The first step to identifying production zones and management strategies for your own farm is to identify and map the production zones across the landscape based on; pastures, soils and topography that exist on the farm. This can be done by either using an electronic mapping program or a hard copy aerial photograph of your property with overlays. The map will give a spatial plan for future management activities (eg. fertiliser inputs, the timing of grazing and pasture establishment) and infrastructure investments (eg. fencing and water points). Having a scaled farm map is also important for accurately measuring paddock sizes so that stocking rates, pasture budgets and fertiliser inputs can be calculated accordingly. Classifying the production zones in the landscape also considers differences in; climate, soil type, slope, landform position, aspect, nutrient balance, acidity, salinity, drainage, stoniness and a host of other physical factors. A simple way to classify your own farm is by reading the landscape. This involves examining natural features such as remnant vegetation, pasture species to determine the soil properties, relative plant available water, fertility and corresponding pasture production potential (eg. potential stocking rates). There are also physical limitations to be considered that prevent some management action such as the steepness of slope excluding cultivation. A good time to assess variability in the landscape, in winter dominant rainfall zones, is late spring when differences in soil water are evident. The EverGraze ‘Dividing up the farm for grazing management’ page located under On-Farm Options provides a simple guide for classifying different landscapes, developing a farm map and an action plan for managing each class, including examples of how landscapes were divided and managed at EverGraze Proof Sites and farm case studies. A more formal description is provided in the Land classification system for NSW. In Victoria, you can develop your own electronic farm map by attending Farm Plan 21 or the EverGraze Dividing up the farm for grazing management program. In NSW, contact your Local Land Services office for information on farm mapping services and training. Once you’ve classified your farm into different production zones, you then need to decide on different management actions. It’s a good idea to conduct soil tests on each of the different production zones to decide on differences in fertiliser requirements. The Five Easy Steps Phosphorus tool can be used to determine critical phosphorus levels so that fertiliser decisions can be made based on the chemical attributes of the soil. However, it is important to also consider other limitations, like top soil depth and gravel content, that limit soil water availability, influence species composition and therefore determine the responsiveness to fertiliser. Ensuring the fertility is adequate on the most productive soils should be the first priority. Fencing to production zone can result in significant benefits to pasture utilisation and protection of more vulnerable areas. The economic return of fencing to different production zones, and the degree to which paddocks are divided and managed separately will depend on a range of different factors. This is discussed more in an economic analysis of the Orange Proof Site grazing systems. The results show that production zones across the landscape are a major driver of soil and pasture properties for diverse native perennial grass pastures. Therefore management should not be implemented evenly across the landscape, and it should be stratified based on management units like production zones, within and between paddocks. Precision management principles can then be used to make decisions about fertiliser, fencing, grazing management and stocking rate of the management units. The HPZ has a higher capacity for production due to greater plant available water and a dominance of higher quality species, but may be limited by nutrients such as phosphorous. The HPZ is more likely to respond to higher fertiliser inputs and sustain higher grazing pressure than the MPZ and LPZ, and these areas should be fenced off so they can be managed separately. At the Panuara site superphosphate fertiliser was only applied to the HPZ for this reason. The HPZ was only 20% of the landscape area, therefore the cost saving is substantial, even if higher fertiliser rates are used in this area.